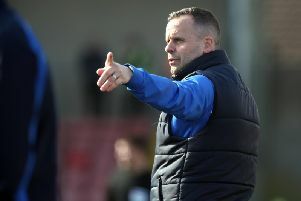 Coleraine boss Oran Kearney is hoping for clearance to allow him to parade new signing Ruaidhri Higgins in Friday night’s Danske Premiership clash against Dungannon Swifts at the Showgrounds. The 30-year-old had his contract at League of Ireland champions Dundalk cancelled by mutual consent and he wasted no time in putting pen to paper on a two and a half year deal with the Bannsiders. Higgins will now form a formidable midfield partnership with Ruairi Harkin and Neil McCafferty. “It all depends on the international clearance whether Ruaidhri will be available or not,” said Kearney. “It’s a brilliant signing. We had talked last summer but nothing happened. However, it just fell right for us this time. Kearney added: “Ruaidhri has just turned 30, so has plenty of good years ahead of him. He has won the League of Ireland five times and played in Europe countless times. Higgins, who made 40 appearances for Dundalk, is also relishing his new challenge. “Coleraine is a big club and there is no reason why we can’t win silverware,” he said. “There’s a great mix of youth and experience at the club and I have no doubt that something can be achieved. It might not happen overnight but you can never rule out winning things. Kearney has also contacted Linfield about the prospect of bring the talented Matthew Clarke to the Showgrounds on a loan basis.